There are two post offices in the area of the Old Quarter. Both are located in the central spots: Rynek Staromiejski (Old City Market Square) and Rynek Nowomiejski (New City Market Square). Post Office Toruń 1 (Toruń's central post office), 87-100, 15 Rynek Staromiejski Sq. (Old City Market Sq. ), phone: 56 619 43 00. At the post office you may send a letters, telegrams and parcels also send a fax, make a photocopy as well as make national money transfers. At the counter No. 11 there is an English speaking staff. Stamp collectors can buy from the philatelic counter available in 28 Piekary Street. Post Office Toruń 10, 87-108, 25 Rynek Nowomiejski (New City Market Sq. ), phone: 56 622 65 25. Open only on weekdays from 8am till 6pm. Domestic stamp (economy mail) is 1,55 zl, abroad 2,40 zl. 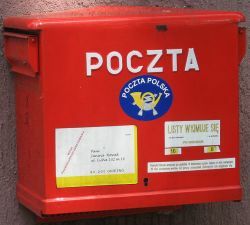 The Polish Post Office offers a wide range of services and has numerous outlets in towns and villages throughout Poland. Polish stamp with Torun theme: Old City Town Hall, 1933. The stamp issued to commemorate the 700th anniversary of Torun city rights. Polish stamp with Torun theme: Old City Town Hall, among the symbols of other cities on map of Poland, 1966. The stamp is one out of nine in a series of Tourism. Polish stamp with Torun theme: River Vistula panorama of Torun Old Quarter, 1969. The stamp is one out of eight in a series of Tourism. Dobar dan!Ja sam strastveni filatelista Makedonske poštanske marke.Sada 28 Aprila izlazi prigodna marka sa likom Nikola Kopernik.Želim je poslati u Torun de je rođen Nikola Kopernik.Dal mi može neko pomoči.Ja da mu pošaljem na kućnu adresu preporučeno+avionski.Kada bude stiglo tamošnja pošta udariče žig i sa tim se dokazuje da je pismo zaista putovalo.Nakon toga pošaljete mi natrag.Poslaču vam i koverat za da mi pošaljete nazad.Molim ko mi može pomoći.